Yes, folks, I think the recession is still with us, but that doesn't mean it's all doom and gloom for businesses. Historically we always see a surge in entrepreneurs setting up in business with people looking for inventive ways to replace their income or just add to it. And there's always certain business sectors that will benefit from the otherwise depressing downturn in the economy, so how can digital marketing help? Yeah, you knew this was coming, didn't you? Social media is everywhere - it's the thing people are most excited about, most scared about and definitely the most confused about! The great thing about social media is there is no financial cost in getting involved, you can set up accounts on Facebook, Twitter, LinkedIn, Google+, YouTube, Pinterest and Instagram completely free. The challenge with social media is using it effectively. Having a strategic plan in place is going to be vital to getting it right and not wasting hours of your time sending updates that are irrelevant and not reaching the right audience at the right time. If you want to maximise your impact on platform such as Facebook, you may want to set aside a small budget for advertising too. Good for: creating brand awareness, building relationships with customers and prospective customers, engaging with your audience. Cost: from £FREE! Perhaps you want a more targeted way of communicating with your audience? 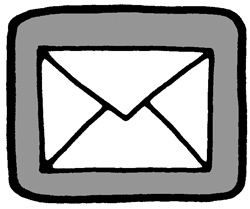 Email marketing is extremely effective at acquiring new customers and a very cost effective way of doing so. If your email list is small (less than 2000), you can use the basic MailChimp package for free for life! (Although additional functionality is billable). Other services provide email marketing for between 0.5p and 1p per email with no set up fees. Try Vertical Response or, if you're serious about your email marketing and looking for something a little more dynamic with automated emails and auto-responders as standard, try AWeber* from $19/month. Good for: Customer acquisition, cross-selling, keeping in touch Cost: from £FREE! Creating content for your site should be part of your online strategy. Not only does it help to raise your profile, demonstrating to your audience that you are an expert in your field, but it's also great for search engine optimisation as Google sees relevant, useful content being added to your site regularly. Good for: raising your profile, SEO, being the go-to person/expert in your field Cost: £FREE! So, if you're looking for low cost ways to get your brand out there and increase your sales on a tight budget, look no further! If you found this article useful, please share it with your friends and followers on social media! We'd be happy to help you get up and running with an online marketing strategy, whether you want some direction for your social media or an in-depth look at all your online activities, get in touch. Older PostDrop in Organic Reach in Facebook?